For anyone who is wondering, tamari is a mostly gluten free Japanese sister of the traditional Chinese soya sauce. And buckwheat noodles are gluten free as well and they keep you full for a long time. 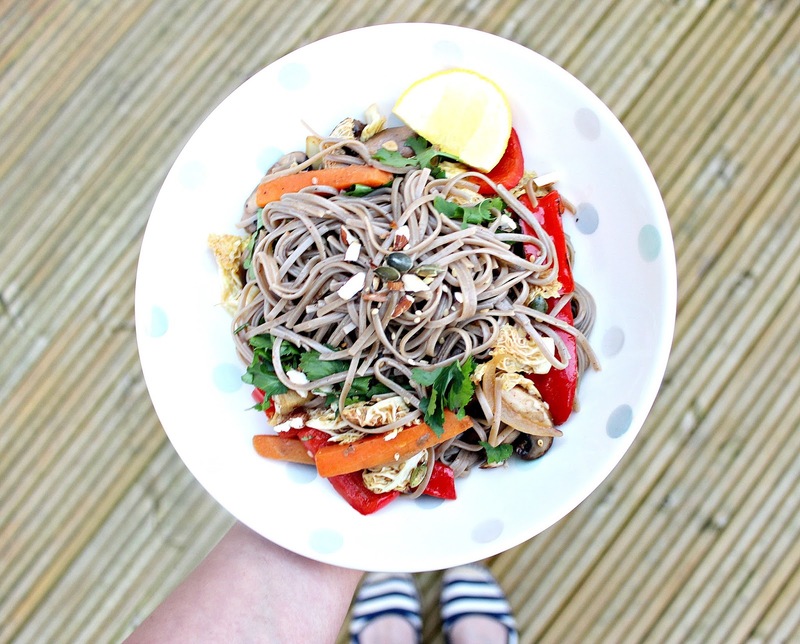 So I have replaced soya sauce with tamari and regular noodles with buckwheat noodles. And I am pleased to report that there is no compromise on the taste, so lets dive right into the recipe! Heat a pan and add some EV olive oil or sesame oil. As the oil heats add finely chopped ginger and garlic. Then add onions and fry for a couple of minutes. As the onions get colour add cabbage and peppers and mushrooms and keep stir frying the veggies on medium to high heat for about 15 to 20 minutes. Meanwhile cook the noodles according to the instructions on the packet. Drain them and set them aside, ready to go. In a small bowl mix tamari, lemon juice, cashew or almond butter or tahini, salt, pepper, chilli flakes, salt, pepper, grated ginger & maple syrup and this will be your stir fry sauce. When the veggies are done, drop this sauce into the pan and mix everything together. Then throw in the noodles as well and keep mixing everything together on low heat. Adjust the stir fry to your taste. I sometimes go in with more tamari or lemon juice or chilli just to make sure the stir fry is punchy enough. Tamari tends to get quite salty so I tend to use minimal to no salt. Again, this depends on how much salt you put in your food. People use dramatically different quantities of salt and you should definitely keep tasting as you are cooking to make sure YOUR seasoning is on point. Finally in small pan I throw in a handful of sesame seeds, pumpkin seeds, pine nuts and crushed almonds and toast them on medium to high heat for about a minute. Once the pan is really hot and they start getting the colour and start getting oily, I throw in a glug of tamari for a beautiful brown-golden glaze. I top my stir fry with this glaze. To serve, I just deposit everything in a bowl, garnish with some greenery (preferably coriander) and some more seeds.